From the vantage point of three score and five years much of what passes as the good life appears to be vanity. We strive after that which does not last; we chase the dreams that, like the wind or quick silver, slip through our fingers without a trace. "Vanity of vanity, all is vanity and striving after the wind," wrote King Solomon, and what was true those thousands of years ago is no less true today. I have been cursed with the insatiable desire to know the motivation behind why things are the way they are. Do you know why you chase fish with a fly? If you were pressed to give a logical reason for the hours you have spent pursuing an activity that is unlikely to ever put one thin dime in your pocket what would you say? Precisely, why do we do what we do? Some things are obvious. For most of my life I got out of bed each weekday and occasionally on the weekend and went off to work. The motivation was the love of my wife, and my desire to secure the means to make her happy. In addition, the pay check allowed me to indulge myself in my rather pricey hobbies like fly fishing, fishing boats, hunting rifles, and all the rest of the paraphernalia that I thought were necessary. What is less obvious is what motivated me to chase trout with a fly rod, stalk big game with a bow, or sit in a blind in the predawn darkness cursing the cold and hoping that a dumb duck would drop into my decoy spread. I don't keep trout, I had a freezer full of prime beef, and except for me no one at my house particularly liked wild duck for Sunday dinner. For many years every available minute of free time was spent pursuing one of my many outdoor pursuits, and I would have been hard pressed to offer a concrete motive for most of it. As a person who perceives himself as a logical fellow such an admission was hard to swallow. It wasn't until last summer that I finally realized what the motive was for all the time I spent chasing fins, fur, and feathers. Surprisingly it had little to do with many of the things I thought were my motives; beautiful places, challenge, curiosity, fun, camaraderie, or any of the myriad other reasons I might have used as justification. It did not come to me in a sudden flash of inspired insight, some existential rationalization based on observed facts, but as the result of deep despair and emotional exhaustion. Last summer after spending a couple hours fishing my favorite trout stream I realized that, for a short time, I had forgotten all of issues that were weighing so heavily upon my heart. For a brief time the weight of the world had been removed from my shoulders, the concerns that marked my daily life at that time had been left behind, and by pursuing that which was without any true importance in my daily affairs I was able, if only for a few brief moments, to reinvigorate my lagging spirit and find hope for yet another day. It was not exactly a eureka moment, and the light bulb didn't suddenly light up over my head, but it was a more gradual realization that although fly-fishing might not be vital to my daily affairs it does have an important place in my life, and there is a logical reason for doing it. Fly fishing, and many of the other seemingly meaningless pursuits that I have pursued, provides a place where I can retreat when the real world becomes too real. On a trout stream I can engage in an activity that can totally captivate my mind to the extent that all the nasty things that may be filling my daily routine are forgotten, if only for a short time. 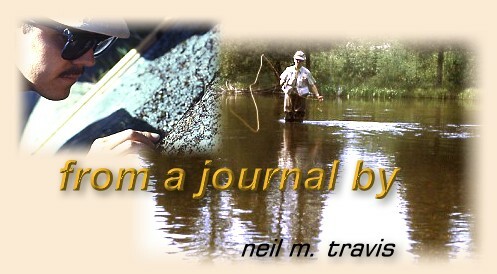 In a real sense the value of fly fishing may just be that it has no value. The world will not end if I fail to hook a fish, economic disaster will not engulf me if I choose the wrong fly, a bad cast will not ruin my career, and any one of a host of decisions I make when I am fishing will disappear like ripples created by a stone cast into the water. No one will be richer or poorer because I bobbled a cast, missed a rise, or spooked the best fish of the day.